Since ancient times, those who dwell under hill and mountain have mystified the world. A people living apart from the other ancestries, fiercely independent, they dig into the bones of the earth to pry gold and gems from the unyielding stone. Called dwarfs for their short stature, their relationship with others in the world are oft marked by tumult and violence, frequently clashing with their neighbors over disputes both real and imagined. When not fighting the faerie or greedy men, the dwarfs fix their attention upon their work, carving out tunnels, hammering ore into weapons and armor of unsurpassed quality, and polishing gems until their brilliance rivals that of the sun. But in these uncertain times, with the shadow spreading across the world, the dwarfs face new trials that beset them, new enemies boiling up from the darkness below and from the lands all around. One by one their mighty fortresses fall, forcing those who flee the destruction to seek haven as refugees in the realms of mankind until the day they can return to claim what is rightfully theirs. For Gold and Glory examines dwarfs living in Rûl, revealing the secrets of their origins and how they fit into the tapestry of people who share these lands, providing those who want to play a dwarf character with the lore the need to flesh them out in detail. 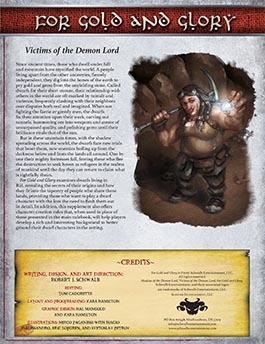 In addition, this supplement also offers character creation rules that, when used in place of those presented in the main rulebook, will help players develop a rich and interesting background to better ground their dwarf characters in the setting. Buy For Gold and Glory as a PDF from Schwalb Entertainment or DriveThruRPG!